If you have no idea what an RSS feed is, you can skip this post. If you are subbed to my blog at atypicalife.net/blog/ then you may have been experiencing excruciatingly slow updates to the feed. That’s cuz I , uh, sorta moved the blog, internally… even though it technically exists at the same address. the feed, however, does not. It should redirect you to the Feedburner one anyway, then we’ll all be happy. I guess there’s this process pledge running around the quilt bloggers. While not exactly pledging, per se, it does at least give me a jumping off point for stuff to blog about. I mean, surely at least my mom will read this post… all the way to the end…. 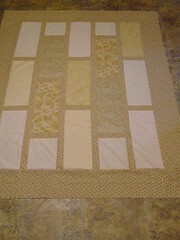 Some quilts take a long time to make. That might seem to you one of the biggest understatements of the year, (“It’s like saying Hitler was a tad disagreeable,”) but there you go. Some quilts take longer than usual because, as my mom says, you have to live with it for a while, before you actually live with it all finished. So once upon a time we wandered in a quilt shop and I fell in love with some fabric. *shrug* It happens. It happens with alarming frequency, actually. I bought a jelly roll of it. I convinced my mom to buy me a charm pack of it. It very quickly mostly sold out before I figured out what to do with it. Also: I am cheap. I don’t want to by yards of something unless I really really (really) need / want it. And I realized afterwards when my local quilt shop owner does her own packs, they contain half the quantities. So I have a smaller stash. And I am stuck. But still we get back to the process – I have these limitations, almost like a challenge or a trick algebra question on the final exam. You have X amount of 4″ squares and Y amount of 2.5″ strips, 44″ long. 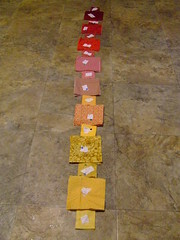 Your challenge: make a usable quilt that is both visually appealing and leaves as little leftovers as possible. I get the fabric in April. By July, I figure out the blocks. All the rest of the summer, I try different variations with the remaining bits of the strips used on the blocks set up on a felt design wall in the craft room. I’ve only done a few blocks to start, while I make up my mind. Then we discover the craft room wall is leaking, mildew is building up, and I pack up all kinds of things. That, in fact, was summer last year, not this one. It sits in a pile until now, shuffled off. Sometimes you need to do that – stuff it in a pile where you can’t see it. Hide it so your subconscious can turn the puzzle around. I have new fabric coming, and the piles on one end of the production line are getting bigger, and things are not progressing down the queue. I resolved about a month ago to actually sew, instead of the real fun part – cutting stuff out. Eventually this pile came to the top, neglected and bawling, and I pressed and I sewed and I plowed through the really quite small pile, whatever took me so long, now really Andrea, sheesh. I lay things out on the floor, when reasonably cleared, sometimes just out of trafficway but where others can see it and make suggestions. Here I am last weekend, testing out fit and the layout in general. Now that I’ve made up my mind on assembly and working on this quilt in particular, I can see that some squares need to be reorganized in terms of color and value, but while doing this, my main point was to figure out where to sew strips in relation to the blocks themselves. I just tossed them down, willy-nilly, spinning them quickly with one hand to line up the edges next to each other. Before I sew the rows together, I’ll get Ron to help make sure color and value are distributed evenly all over the quilt. No two prints touching, like cartographers of fabric. 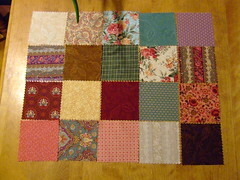 Four rows of five blocks, and using strips means making sure I have enough for a border all the way around. There are two rows of strips between the rows of blocks, but not through the middle itself. 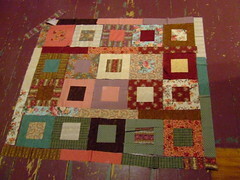 The strips as rows are added deliberately to make the quilt more square, instead of along the other way, where there are more blocks. I overlapped them slightly to account for seams. The upper left shows one remaining strip, and if I guesstimated this correctly, I will have probably a 6″ strip left over. And then, THEN it can sit in the “finished tops” pile, which, although growing at a substantially slower rate than the “to cut” pile, is at long last growing. I can decide on the binding (leaning towards a dark color here) and backing later, either finding something in my stash or breaking down and actually buying yardage from the same line if I can find some. This one, I think, would be worth it. And lets face it – my mom doesn’t have any yardage of this line in her stash. No ideas yet on the actual design of the stitching when I do get around to quilting the layers together. I think I’d like to do swirly more so than following lines, though my free motion skills are laughable right now. It is a small-ish quilt though, literally only covering your lap, or a small side table or a section of floor for a very special indoor picnic with your best play teacups, the antique ones in the cupboard that belonged to your auntie. I got a new book out of the library yesterday. They have a display by the door, themed according to season or the librarian’s whim, new releases or just books to highlight. Please, somebody check me out and read me, they say. I swept my arm along the row and took the whole lot. One of them looks brand new, never read, pristine. It is thick, easily four hundred pages. Maybe more, I haven’t checked to be certain. If I do, I might read the end, because I do that to books sometimes. I prefer paperbacks as they are easier to hold up in bed, and they hurt less when they inevitably crash down towards my head as my eyelids struggle to stay open. Besides, I am one of those people: book manglers. Hardcovers don’t mangle as easily. I dog ear pages, and I (God forbid) crack spines. This book is pristine; I feel bad for it, being the first person to read it. I am struggling to hold the left side down with my plate over lunch, it’s that thick. A few pages in, I am hooked. I try and remember to take it upstairs for bedtime. I read faster, skimming, to get further into the story before my lunch is finished and it’s back to work time (or blogging, yes). Alas, I turn the page and see it: a dog-ear. Someone has been here before me. The next page has words carefully underlined. Invigorating, convalescent, effervescent, efficacious, elixir, expectantly, epigrams. I wonder, why are these words in particular underlined, and not ones on previous pages? Why invigorating and expectantly, fairly common words? The previous reader seems to have gone no further, exhausted by the vowels and consonants lined up in unfamiliar arrangements. My lunch is done. I put the book down mid-stream but satisfied. There will be much spine-cracking this evening with far less guilt involved. The book will eventually return, a little worse for wear, but letting other patrons know, I have been read. Read me. So I did take Saturday off and did some quilting. I ran into town with Meaghan and stopped in the local quilt shop. No fabric, as I had just bought some off ebay. (oops.) For some reason I was unsettled. The owner was off on a fabric buying spree and a lot of the shelves were empty. There needs to be more brights, as the shop tends to stock the dark reds, blues and browns. We also buzzed by Global where Meaghan got some shirts and I found a long hispter scarf for Sarah. I think it’s cashmere. 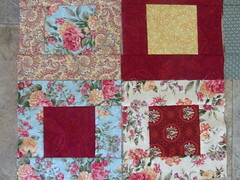 I cut out the rest of the blocks for the red & yellow quilt I designed. Well, the top is done. 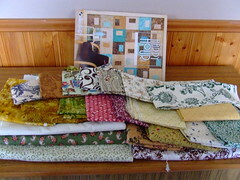 It will join the “to be quilted” pile. I have a bug in my ear about setting up a decent work area. Since the craft room is kinda falling apart, I’m squished in another room, and I can’t store stuff on the table, hold pending projects and flop a bed-sized quilt around all within earshot of one kid on the laptop and another in front of the tv. Maddeningly frustrating, at least to me. I also cleared out the red bedroom a little more – the one full of junk with the holes in the wall right next to the office. It had holes in the wall when we moved in, I swear. It would do for a craft room over winter, yes it would. At least I was able to take a few boxes of stuff and put them in our huge closet, instead of taking up floor space in a room we could either use or start working in if it was empty. The stuff in the boxes currently has no place to go. It’s either stuff we want to keep (memorabilia, family history) or pictures and frames. Some of them can go on the walls, but some the glass was cracked and needs fixing. I put it back in the box for one less thing to do. It can wait. I also put another dresser in Emma’s room – this one left by Sarah – and took out her little bookshelf crammed with books. It went into the upper hallway to be with its friends, the other two bookcases that live there. At least the other two with children’s books. On Sunday, Emma & I went into town and oh darn Meaghan couldn’t come with us as she was making apple pie. Her birthday is in less than a week now, and that will mean I officially have 3 adult children out of 4. Tho, as my friend Jo pointed out, she’s been considered by family to be pretty much an adult anyway. Some days I dream of being just a housewife again. Groceries last night, $147. I think. When San was here, she had a very small pile of stuff from my mom’s – socks, a book for me, and a stack of Calvin & Hobbes she picked up at a yard sale. They are scattered across the house, open here & there. Ron & I read them together over lunch & dinner, when not talking about work. Emma’s reading some out loud to me. We also skipped down to Fredericton Tuesday night for a Twitter meetup. It was… okay. Hard to talk to new people when it’s so loud you can barely hear yourself think. We took Sarah with us and her friend mike showed up, so we sat & helped him eat his bucket o’ poutine. Then we went home. I said that counted for a date night for us, crazy partiers we are. At least I have a twitter sticker for my netbook, which is now almost completely covered. Starting to think a little about Christmas too. Also, Emma said she wanted to skip Halloween this year. I don’t blame her – half the houses we ever went to seemed quite shocked people were knocking on their door, even houses with decorations. Too much work for too little return, might as well buy a bag of candy. Which, she decided, we probably don’t need anyway. Tho we do have a bit of decorations up inside. I also am re-reading The Time Traveller’s Wife, lost in Henry & Clare.